Warp Barrels are the rarest barrels in the Donkey Kong Country and Donkey Kong Land game series. As their names suggest, Warp Barrels warp the Kongs to the stage's goal. Many Warp Barrels are located in certain almost inaccessible zones, usually hidden off-screen or invisible. Warp Barrels are an optional way to finish a stage, because they act as shortcuts, but they do not affect game progress. In Donkey Kong Country 2: Diddy's Kong Quest, Donkey Kong Country 3: Dixie Kong's Double Trouble!, and the Game Boy Advance remake of Donkey Kong Country, Warp Barrels are found in every level in each game's first two worlds (Kongo Jungle and Monkey Mines in DKC, Gangplank Galleon and Crocodile Cauldron in DKC2, and Lake Orangatanga and Kremwood Forest in DKC3). 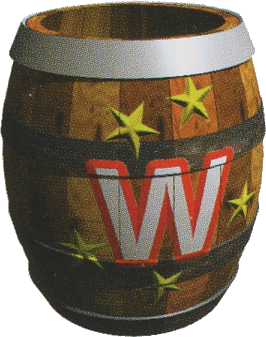 Usually, they appear as barrels with a "W" for "warp" painted on them (and covered with stars in the Donkey Kong Country series). In Donkey Kong Country, they appeared as Auto-Fire Barrels. Extra Life Balloons usually appear in warp stages. This page was last edited on April 10, 2019, at 21:42.